SynTech Research recently participated in a professional training course at this year’s North American SETAC meeting in Sacramento, CA. This covered Methods for Sampling Nectar and Pollen for Pollinator Exposure Assessment. 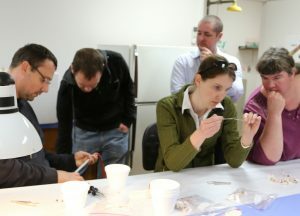 Houston Howerton and Joe Wheelock of SynTech Research, and Vince Kramer of Corteva, provided a lecture and hands-on practical training for sampling pollen and nectar. Topics covered included an overview explaining why tier 2 studies are performed, a look at the risk assessment process, field design including hive selection for tunneled and non-tunneled residue studies and sampling methods for pollen and nectar with a practical demonstration using live flowers.